Discovered in 1882, Mammoth Cave is the most extensive in the Jenolan complex. Exploring Mammoth will have you underground for approximately 6 hours and involves extensive climbing, crawling, scrambling, squeezes and some cave ladder work. The cave can be muddy, wet and slippery but the beautiful large caverns and the underground Lower River make it all worthwhile. On arrival to Jenolan Caves you will meet your guides and get kitted out in overalls, knee pads, helmet and head torch. Setting off you will pass by the spectacular Devil's Coach House, enjoy a serene half hour hike through the bush before descending into the historic underworld of Mammoth Cave. Adventure caving is about leaving the paths and fixed lights and following your experienced guide to the depths of the earth. Seeing these wilder, undeveloped areas will enhance your understanding of this magnificent and ancient environment. Your hard work will be rewarded once you reach the large and well decorated chambers (one of absolutely breathtaking beauty). The ancient limestone landscape conceals a labyrinth of caverns decorated in calcite crystal - rich in shape, colour and texture. Stalactites, stalagmites, columns and shawls are just some the stunning formations that you’ll find as well as a swift flowing section of the underground river system. You are guaranteed to be blown away by the unusual beauty that lies beneath the earth’s surface. Whenever you are caving, you should respect the natural environment. Though it’s tempting to touch or maybe even break off a piece of the decoration, this ruins the delicate surroundings and has led to the destruction of many once beautiful underground areas. If you leave it how you found it, others will be able to enjoy it for years to come. The Mammoth Cave delivers challenge after challenge and is great for those desiring a full day of adventure. If you are lucky enough, you may even reach Hell's Hole! 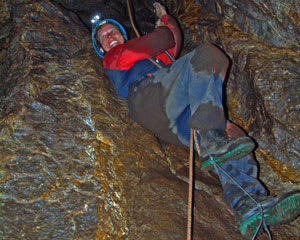 WEATHER: Caving goes ahead rain, hail or shine as it is all underground exploration! Extreme fires and floods are the only enemies, but in general, the gig is on unless we call you. The caves are a consistent 15 degrees inside all year round. The Jenolan Caves are a leisurely 2½ hour drive from Penrith. The entrance is astounding and just a taste of the awe-inspiring surrounds in which you are about to be immersed. This is the perfect day out for adventurers, take advantage of the ‘Caves House’ to satisfy your hunger with a hot meal. Maximum number of 10 participants for this tour. Stuart and Peter our cave guides were exceptional and made the extreemely exhausting adventure enjoyable. Pleasure to go caving with. will try another adventure when the weather's a bit warmer.